According to The History of the County Palatine and Duchy of Lancaster, the first stone of Christ Church was laid on 29 April 1830, though the church was officially founded on 28 May 1830 . It was consecrated in the following year on 4 November 1831. In 1847, the building was enlarged. The following is an excerpt from: Like A Mighty Tortoise by The Rev'd Arthur J Dobb & Derek Ralphs. This splendid church was located at the end of Acton Square in Salford with the Manchester, Bolton & Bury Canal at the rear of the Church... The Canal Company changed its affection for the new form of bulk transport - railways. 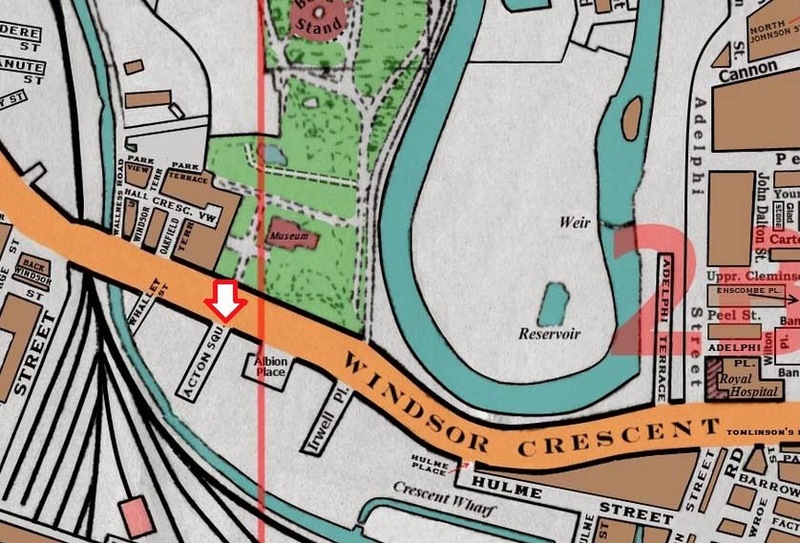 In 1838 the Manchester, Bolton and Bury line opened with its terminus situated in Salford. The population figures exploded as people crowded into the limited accommodation of the village and in no time the picturesque half-timbered houses had been demolished and replaced by brick high density, back-to-back terraces which became notorious as "The Classic Slum". Into this needy area came one man whose name can still be found in many places in the Diocese - Hugh Stowell (e.g. St. Matthew's, Bolton, is flanked by Stowell Street). It was actually with great reluctance that Bishop Bloomfield of Chester licensed this firebrand, evangelical Curate of Huddersfield, to be in sole charge of St. Stephens. In his generation the preaching and influence of Canon Stowell eclipsed that of Bishops, Deans and Residentiary Canons. Hugh Stowell born 3rd December 1799 was the son of a Manx clergyman of the same name noted for his piety and simple eloquence. Young Hugh was educated privately and then in 1818 went to St. Edmund Hall : Oxford where he graduated in 1822. He was ordained the following year by the Bishop of Bristol and licensed to the curacy of Sheepscombe in the Cotswold Hills. 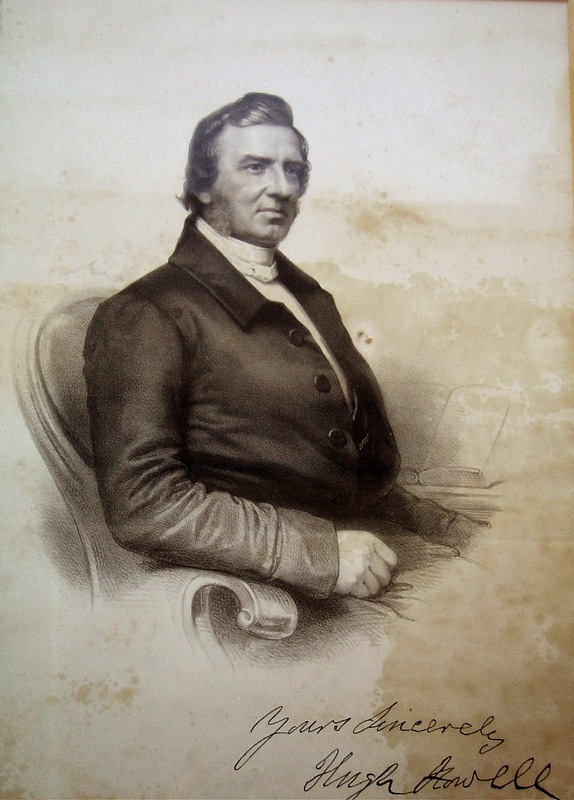 In 1824 he moved to Huddersfield for a second curacy and stayed about two years before coming to Salford and transforming the congregation of St. Stephen's within a few weeks of his arrival, to "standing-room only". Men of Stowell's ability were in great demand and it was obvious to the townsfolk of Salford that if their young minister was going to stay in the town then a church of some grace must be provided to counteract the many attractive offers which would come from beyond the ancient Manchester Parish boundaries. It was equally apparent that the Warden and Fellows of the Collegiate Church would never offer Stowell one of the churches in their Patronage; in fact they took all possible measures to hinder the St. Stephen's curate and his friends. These were days of church building. St. Philip's Salford was built in 1825 under the "Million Pound" Act but Parliament also wished to encourage the private patronage of church building. In 1827 the Trustees Church Building Act was passed which granted to anyone building a church, the right of nomination in perpetuity, and their successors. 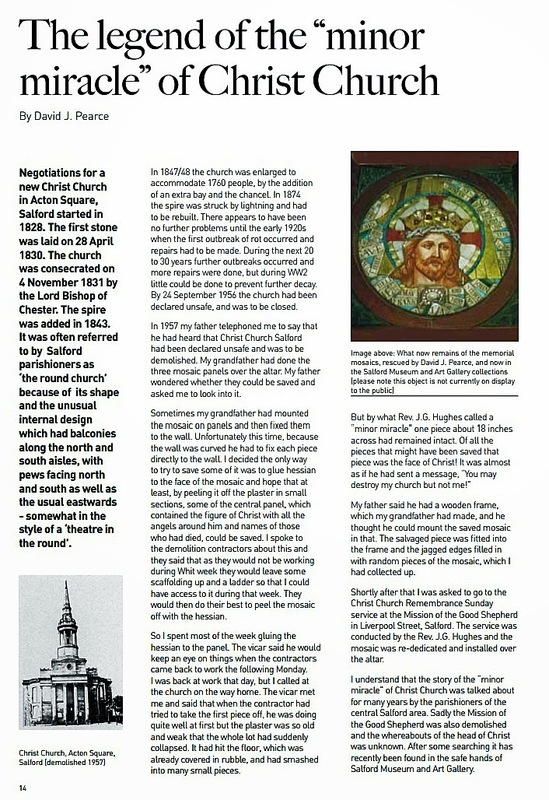 The first church to be built under the Act was Christ Church, Salford. Early in 1828 a group of twelve men, under the Chairmanship of Mr. Robert Gardner, founder of the great Manchester textile firm of Tootal, Broadhurst Lee, wrote to the Commissioners for permission, under the Act, to build a church and claimed the right to nominate the Incumbents, a right contested by the clergy of the Manchester Collegiate foundation under their Royal Charter. To remove any possible doubt another Bill called "The Trustees Church Building Act" was inspired by the Salford Committee and passed through Parliament in 1831. This second Act became law on 5th October, yet further legal opinion was taken to satisfy the Trustees that their right of Presentation was fully protected before finally committing their new church to the rule of the Established Church. On 29th October 1831 Counsel stated that they "will be secure against any attempt on the part of the Collegiate body to interfere with their rights". Within three weeks of the passing of the 1831 Act, on 4th November, Christ Church was consecrated and Hugh Stowell appointed its first Incumbent, the one and only preferment he held and that until his death. The total cost of the original building (the spire was not added until 1843) was only £6,075 - 16s - 41/4d but optimism must have overrun the sponsors for when it was opened there was an outstanding debt of £3.750 - 10s - 7d or well over 50% of the cost. Stowell remained aloof from the building Committee meetings, although the layout of this veritable preaching house, seating 1,300 people carried the orator's stamp with its huge central three-decker pulpit. Even so the intended Minister did actually lay the first stone on 28th April 1830 of the church built "in Acton Square beyond the Crescent". The architect was Mr.Thomas Wright [of Salford] and the builder Mr. James White. One biographer states "Mr. StoweIl's name has not come before the world as the author of any great and learned works of theology or other subjects" but his influence centred at Acton Square was considerable in the Church and County. He was one of the founders of the Church Pastoral Aid Society and an ardent supporter of the Church Missionary Society forwarding an average of £500 per annum to its work from his congregation. In recognition of his labours he was in 1845 appointed a Canon of Chester Cathedral, in 1851 an examining Chaplain to the Bishop of Manchester and subsequently Rural Dean of Salford. There was also a good measure of parochial charity in Hugh Stowell's work, not least his advocacy of education. In 1831 the Hulme Street School was opened as a Sunday School, and in 1839 another school, in Hope Street, opened as both a Day and Sunday School. When the great discussion arose in Manchester on the education question he took a prominent part on behalf of the religious party. He spoke for more than two hours persuading the House ,"not to sanction any system of general education of which the Christian religion is not the basis". His educational policy was direct and simple, "either Christianise it or crush it". Hugh Stowell made enemies as easily as friends. When he was invited to speak at the meeting of the Manchester Church Congress he was howled down by rows of Ritualist curates. He was a Protestant of vigilant nature. It is said he, more than anyone else, was responsible for ensuring the Roman Catholic Cathedral of Salford was built where it is and not within his own Parish. He agitated for the passing of the Ecclesiastical Titles Bill and was for more than twenty-five years President of the Manchester and Salford Operative Protestant Association. So outspoken and bitter was his condemnation of the Roman Catholicism that he was taken to Court in 1840 by one priest for his libelous attacks. Stowell only proved his innocence after an appeal to the Court of the Queen's Bench. The main population growth of Salford took place towards the middle of 19th century. In 1821 there were 25,700 inhabitants and by 1841 probably 40,000. If steps had not been taken by Stowell and others to divide the Parish of Christ Church it would have had about 60,000 folk living within its borders by 1880. In 1841 St. Bartholomew's Church, the first of four new churches whose parishes were to be carved out of Christ Church, was built, largely through the influence of Hugh Stowell by the Ten Churches Association and one of his former curates was appointed its first Minister. This church closed on the first Sunday in 1974 and was demolished in 1975. 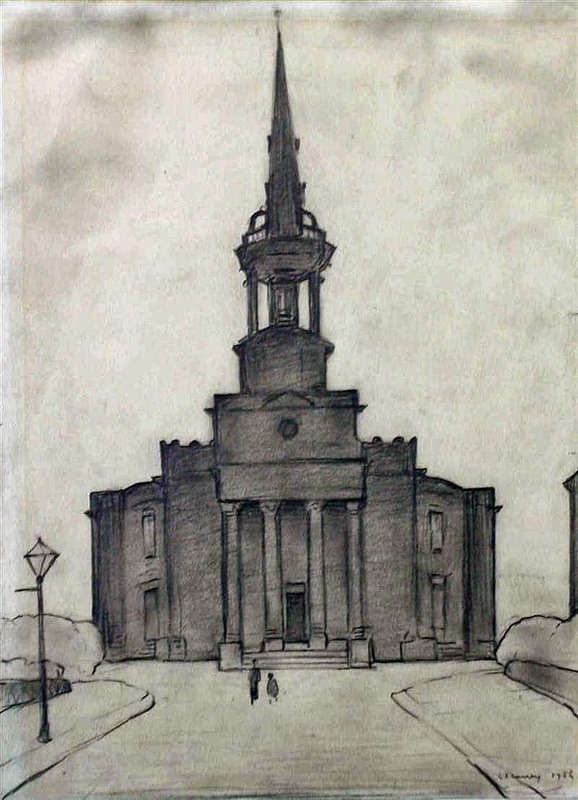 In 1856 the small Waterloo Church of St. Paul's, Ellor Street, was built and a portion of the district of Christ Church assigned to the charge of its Incumbent. 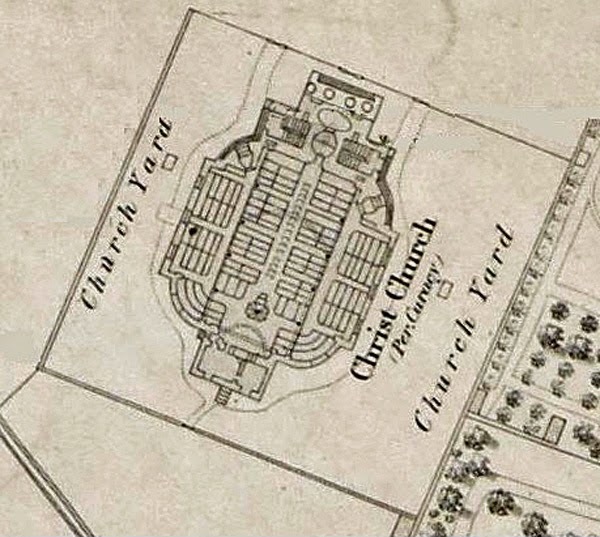 It is somewhat ironical that after Christ Church had been demolished the residual Parish area was transferred to the care of St. Paul's. the 150 foot spire, so placed as seemingly in the centre of the road junction. The foundation stone of the church was laid on 19th October 1867 by Bishop Prince Lee and cost about £8,000 to build. The whole scheme, including a School and Rectory was paid for by public subscription and ministered to a Parish constituted out of those of Christ Church and St. Bartholomew. The tower is all that remains of the church standing as a beacon at the start of the M 602 motorway. The fourth "daughter" Church was built in 1878 St. Clement, Ordsall. The seating accommodation at Christ Church itself proved inadequate and an extra bay was added, with the semi-circular apse, in 1847-8. This was the church which witnessed the incredible funeral scenes on 13th October 1865 when Canon Stowell was buried in his family vault under the church by express permission of the Home Secretary. The Diocesan Bishop led more than 200 clergy at the head of a mile long procession as Salford mourned the death of their Rector. The family name was not to leave Christ Church as the Trustees appointed the youngest of the Canon's two surviving sons. 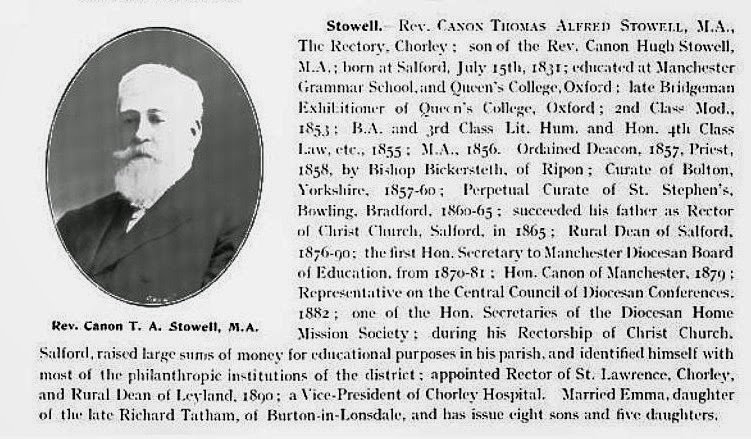 The Rev'd Thomas Alfred Stowell to follow his father, a post he held until 1890 when he accepted an offer to the living of Chorley. In 1874 the spire of the church was hit by lightning and was rebuilt with a central iron reinforcing. In 1958, due to the added reinforcement, the demolition contractors took five days to demolish the spire. The tremendous impact of Christ Church on all spheres of life both locally and nationally is self-evident from the list of Wardens, Trustees, Members of the Congregation and Leaders of the many and varied organisations, and the shrewd businessmen provided over £1,500, about a quarter of the capital cost, as an "Endowment and Repair Fund". This sum proved totally inadequate generations later to meet the cost of eradicating the dry rot at an estimated sum of £40,000. The defect lay in the structure allowed in the first phase of building when the committee had permitted the architect to use natural stone for the front portico and to stucco-render the side and rear brickwork. The chancel extension of 1847 brought the building within a few yards of the canal banking which caused perpetual dampness; perhaps another factor in the final chapter of this once great church. In 1946 Mr. Ernest Hill, the son of a former Rector, an architect and also a trustee, examined a serious outbreak of dry-rot and diagnosed it as the most virulent type which would cause the disintegration of timber, mortar, brickwork and plaster alike. There seemed no alternative but to demolish the building for if any money was spent on trying to cure the outbreak it would only reoccur a decade later. Unfortunately Mr. Hill died soon after giving his professional opinion and his advice was ignored. Money was spent but in 1955 Mr. Hill was proved right as even more extensive outbreaks were found – the beam across the apse opening had completely disintegrated to powder. The last service to be held in the church was the Harvest Thanksgiving Service on 30th September 1956 after which the Mission Church of the Good Shepherd was used as the Parish Church until 1963 when the Parish was joined to St. Paul's. The decision to demolish the building was not taken lightly as it was scheduled under the Town and Country Planning Act as of architectural merit with it's fine interior of square Georgian period. On 17th September 1957 a faculty for demolition was granted in the Manchester Diocesan Consistory Court and the actual work done in Summer of 1958. The last words of the Christ Church saga belong to Bishop Warman when he preached the centenary sermon. "When during the last few days I was reading a history of the Church of England, written by a churchman who had not very much sympathy with the Evangelical Movement, I came across this passage: "Evangelicalism touched the great towns of the North,' invaded them; captured their pulpits and, perhaps chiefest among them, Hugh Stowell conquered Manchester". 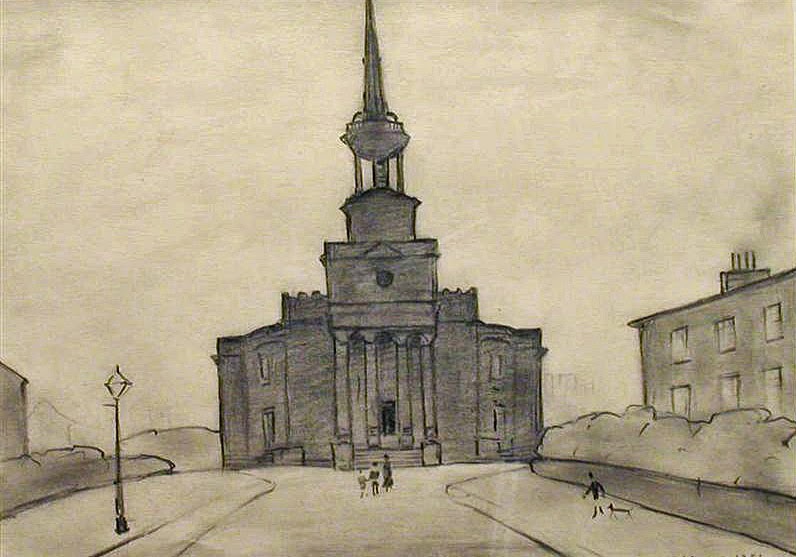 When Sir John Betjeman published his Collins Guide to English Parish Churches in 1958, he dedicated it to the memory of St. Agnes' Church, Kennington, and Christ Church, Salford 'fine churches of unfashionable date demolished since the war'. The church and schools cost upwards of £15,000, the whole of which sum was voluntarily contributed. This church, which was considerably enlarged in 1847, contains 1,900 seats, of which 750 are free. 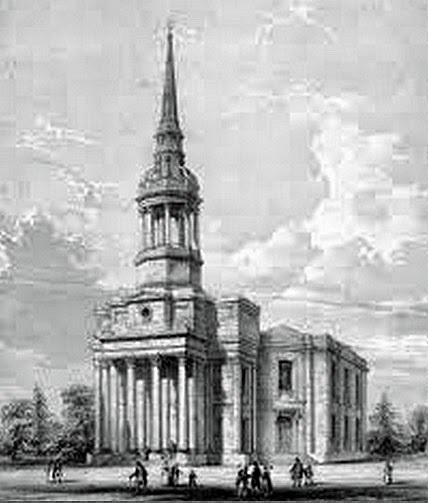 It is remarkable as having been the first church which was consecrated under the act of Parliament, which, for the encouragement of persons willing to build churches, gives the right of nomination in perpetuity to the persons erecting them, and providing that when the number of subscribers is more than five the patronage shall be vested in that number of trustees, to be chosen in the first instance by the subscribers themselves, and filled up on every subsequent vacancy by the remaining trustees, in conjunction with the incumbent. The district of Christ Church was constituted a parish and rectory under the act for re-arranging the spiritualities of Manchester. At the last census the parish contained a population of about 10,000." The Rev. Stowell died of congestive heart failure after complications from diphtheria. Stowell was married in 1828 to Anne Susannah, eldest daughter of Mr. Richard Ashworth, barrister, of Strawberry Hill, Pendleton. They had a family of three sons and six daughters. 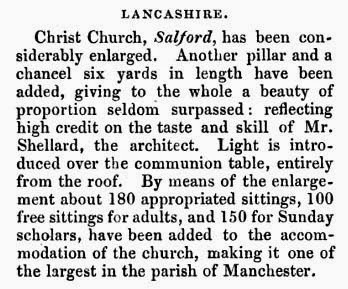 See: Sermons Preached in Christ Church, Salford and his entry in the DNB. Thomas was the second child of Hugh Stowell. He was born in Salford on 18 July 1831 and baptised by his father at Christ Church, Salford, on 07 Dec 1831, just a month after the consecration of the church and his father's appointment as the church's first rector. See Who's Who (1904) entry. Rev. George John Howson (1854-1943) Rector of Christ Church, Salford, 1901-1905. Howson, George John. Adm. pens. at Trinity College (Cambridge), Aug.11, 1873. eldest son of the Very Rev. John Saul Howson (1833), Dean of Chester. Born May 2, 1854, at Liverpool. Schools [Liverpool College and] Haileybury. Matric. Michs 1873; B.A. (Theol. Trip., 1st Class) 1877; equal for Evans prize, 1877, M.A. 1880. Ord. deacon (Canterbury) 1877; priest 1878 C. of All Saints', Maidstone, 1877-9. R. of Overton, Flints.,1879-88. V. of Crewe, 1888-1901. R. of Christ Church, Salford 1901-5. R. of St. Mary's, Crumpsall, Manchester, 1905-6. V. of St. Andrew's, Southport, 1906-12. Hon. Canon of Liverpool, 1911-16: Canon, 1923-31. R. of Much Woolton, Lancs., 1912-23. Archdeacon of Warrington, 1916-33; of Liverpool 1933-4. Chaplain of the Order of St. John of Jerusalem, 1933. Public pr., dio. of Southwark, 1935-43. Author, Overton in Days Gone By. Latterly of 79, Deodar Road, Putney. London, S.W. Died May 20, 1943, at Morfa Bychan, Carnarvons. Buried at Overton. Brother of the James Francis and of Edmund W. (1874). Several curates were active at Christ Church: William Cole (circa 1883-1893), Rev. James Tweedie (circa 1895-1897), Rev. 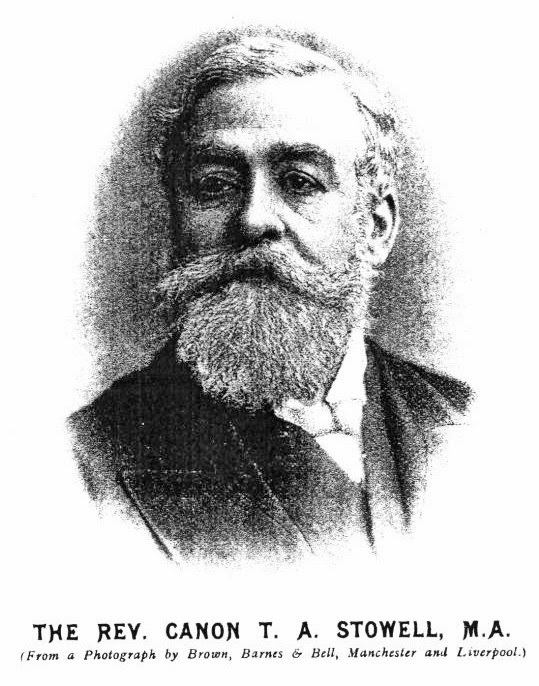 Frederick Knight, B.A. (circa 1892-1898, when was appointed Rector of St. Mary's, Droylsden) and James Henry Whitehead (circa 1881-1901). The Rev. James Henry Whitehead was educated at Manchester Grammar Sohool under Mr. F. W. Walker, M.A., elected open classical scholar of Sidney Sussex College, Cambridge, 1876. and Somerset Scholar of St. John's -College, Cambridge, 1877 ; graduated -B.A., 1880, M.A., 1884 ; elected Fellow of the Royal Historical Society, 1879; ordained deacon 1881. and priest 1882, by Bishop Fraser of Manchester, and licensed to Christ Church, Salford, for training in parochial organisation bv Canon Stowell. He was curate of Alderly Edge (from 1884 to 1891, and Barthomly Crewe from 1891 to 1897. In that year he was awarded a grant of £50 per year for having served the Church fifteen years sans reproche. In 1889 he published his first work, " Practical Hints on the Public Reading of the Liturgy." In 1892 he was appointed general editor of "Nisbet's Scripture Handbooks," especially prepared for the use of candidates for the Oxford and Cambridge examinations. Owing, however, to ill-health, Mr. Whitehead was ordered to take a long voyage. He arrived in New South Wales, and was so benefited by the trip that he resumed his ministerial career in 1904 atForbes, New South Wales, until 1906, when hewas appointed Rector of Tingalpa, Queensland. Note: Not to be confused with Christ Church, King Street, Salford, which was founded in 1800. 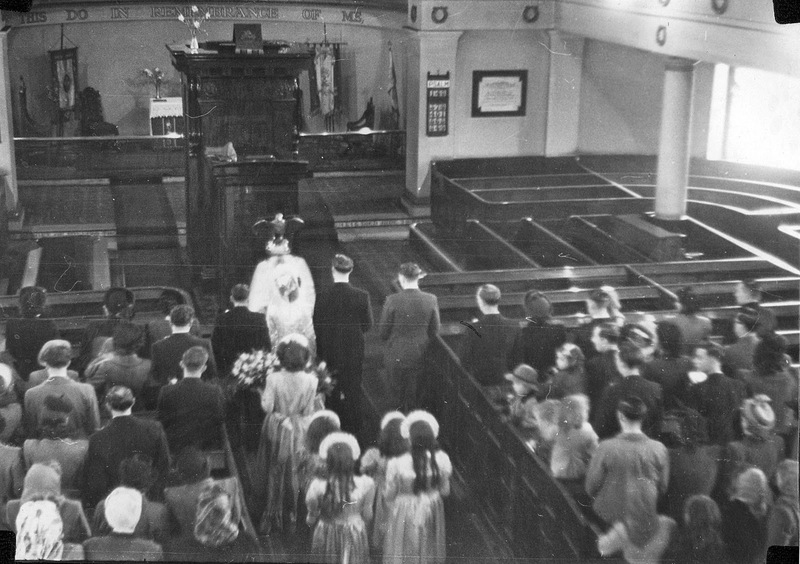 Marriage of John Taylor to Irene Wood, Rev. J. G. Hughes officiating. Have just found a Christ Church Salford 'In commemoration of sixty years reign' (Queen Victoria) medal from 1897. It is about the size and weigh of a crown. Are these things of any value? I'm new to the world of communicating with bloggers, but i hope this reaches you and that you will send me a reply. I'm an architectural historian, currently working on an academic book about the late-Georgian parish church in England and I stumbled upon your image of Christ Church, Salford by chance. As a late example of Classicism, Thomas Wright's design is particularly significant, especially in a stronghold of Gothic like Lancashire. I'd very much like a copy of this image for my collection and perhaps for eventual publication. Do you have the original print, or a high resolution copy of it that you would be prepared to share with me? Or can you tell me in which mid-nineteenth-century book it appeared? If you can assist me, I'll be most grateful. My Grand Mother, Maud Mary Frisby was baptised at Christ Church in 1883 by T.A. Stowell.